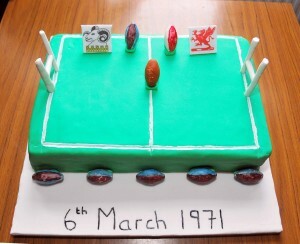 As you can see from the picture, Hillfoots RFC was founded in 1971 and celebrated its 40th birthday in 2011. We are always in the process of jogging the memory of our more senior Club members for their recollections and to create a detailed history of the Club. We’ll post things as we get them. We are indebted to Campbell Calder for providing us with the written recollections of Jim Calder his late father, dating from 1979, which are reproduced in the seasons pages below. In The Woolpack Inn hangs a framed narrative entitled “At Home at last – We think”, which tells the story of the very beginning of Hillfoots RFC. Drank well & shared their crack. And here the Hillfoots Club was founded. These are the first two verses of a poetic address speech which was delivered at the final Club Dinner prior to the opening of the current Club House in the Oak Mill in September 1979. The ceremony was carried out by President Ross of the SRU. The extract refers to the formation of Hillfoots RFC by a group of enthusiasts, notably Ian Scott & Morgan Philips ably abetted Charlie Stalker, Derek Phaup & several others. The origins of the Club came from a particularly successful rugby playing year group in 1970 at Alva Academy. The players were looking for a way to continue playing rugby after leaving school, but they were not satisfied with the arrangements at the established local Clubs in the area. So, showing an entrpreneurial spirit that lingers to this day, they set about forming their own brand new Club – Hillfoots RFC. The 1971 Club constitution stated that the “purpose of the Club is to promote good rugby football within the Hillfoots area”. So – in 40 years, no change there then! It is particularly exciting to see Hillfoots RFC in 2012 as a founding partner (alongside the SRU & Clackmannanshire Council) in the newly created School of Rugby at Alva Academy, to encourage the game of rugby amongst S1 to S5 pupils. What goes around, comes around, or as our dear friends in France at twinned rugby club Beauvais would say, “plus ca change, plus c’est la meme chose”! The formation of the Club took place in February 1971 & the historic first game was played at Tillicoultry Public Park on Saturday 6 March 1971 against Alloa RFC’s 4th XV, a game that the home side won by 18 points to 11, the try scorers were A Elsworth (2) & A Sinclair, with a dropped goal by R Cameron plus conversions by A Sinclair (2) and Peter Norman. At that time the Hillfoots players were all Alva Academy senior pupils & former pupils. The line up was Derek Phaup, R Whitehead, A Elsworth, R Cameron, R McEwan, A Sinclair, J Stalker, W Keir, A Hodge, P Scott, Peter Norman (the current Club President), G Wyllie, W Lyons, W McMurray & D Simpson. Such was the enthusiasm for rugby in the Hillfoots’ towns of Menstrie, Alva, Tillicoultry & Dollar that 4 weeks after the first game a 2nd XV joined the 1st XV & the Club advanced from strength to strength.